Faster, more compact, and cheaper than our Award Winning Series 99 Photodetectors. M,F&A's continuously improved Amplified Differential Photodetector Modules allow detection of the difference between two optical signals at bandwidths up to 12 GHz and overall optical conversion gains of up to one million volts/watt or more. They are perfectly suited for detection of the phase difference between two otherwise identical signals such as in range finding or in phase encoded communication protocols. 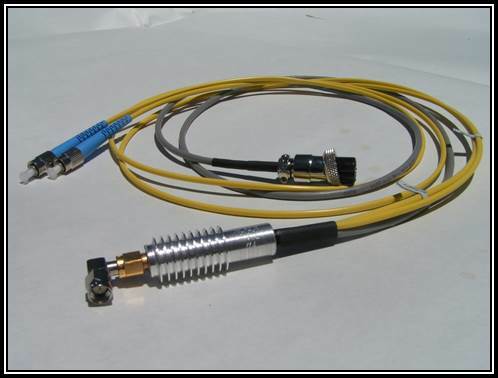 Other applications include the detection of small optical modulations on a high power or unpredictably variable background. In these modules the signal differencing is done at the optical input stage, before amplification, where the two photodiodes are arranged in a “totem-pole” configuration, as in TTL logic circuits. The amplifier input is taken from the node between the two photodiodes, so the amplifier sees only the difference between the two photodiode currents. These modules are available with the same broad range of photodiode and amplifier choices as our Series F Single Photodetector Modules. Please skip to that page for details and specifications. The two photodiodes are normally matched in Responsivity to within 3%. Tighter match tolerance is available at a nominal surcharge. Please inquire for specifics and to discuss your exact needs. We will build your Photodetectors to your specifications. The price of your detector is simply the sum of the prices of the chosen specified options. Email us your specifications from the list under Summary and Prices above. We will return a formal quotation to confirm your specifications and expected delivery time. Quantity discounts are available, send a Request for Quotation. Please note that these modules contain technology at the leading edge of the state of the art. Prices and specifications are subject to change.